Sometimes what the macro decides to search for is not what you want it to search for. 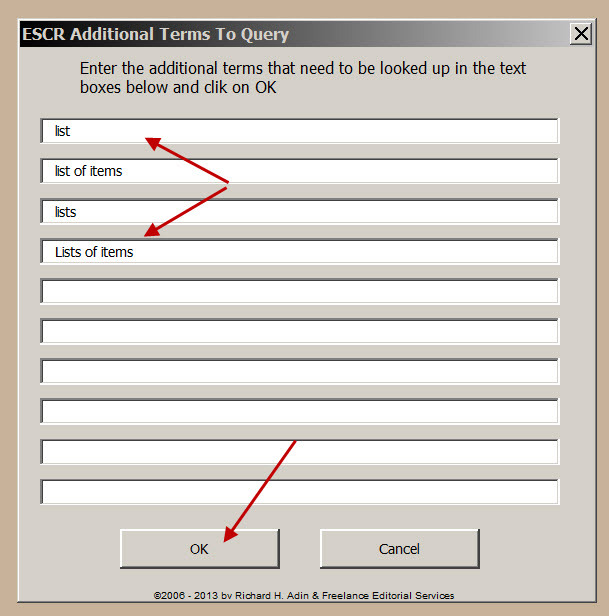 ESCR now offers the capability to not search for a listed term, as well as the ability to add search terms. As the following image shows, when you select a word or phrase to search for, the macro automatically generates a list of items to search for. In version 5, you can deselect items that you don&apos;t want searched for by clicking on the checkbox next to the word or phrase not to be searched for to remove the checkmark. If you want the macro to search for a word or phrase that is not already in the include list, click on Add terms… at the bottom of the dialog box. That brings up the following dialog box in which you can enter the additional terms you want searched for. 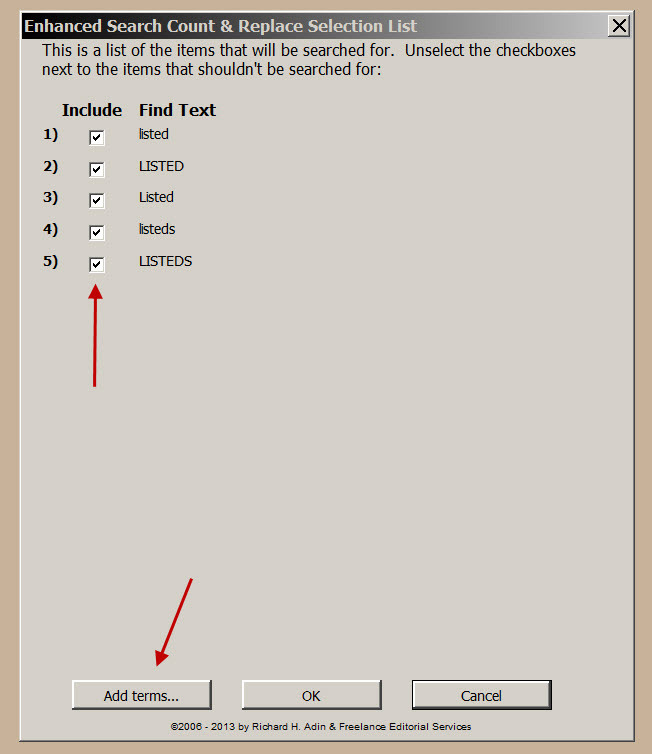 After entering the additional terms, click OK and the terms are added to the include in search list, as shown below. 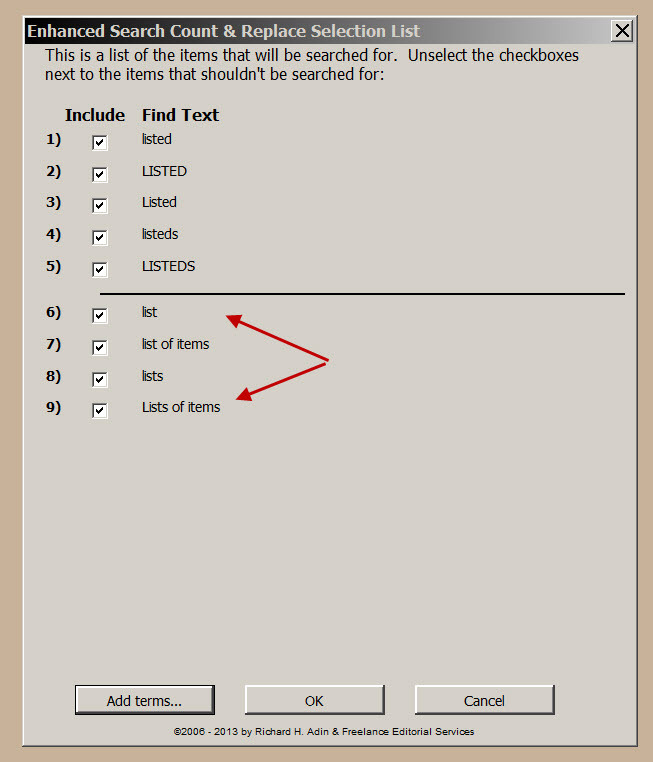 When ESCR is then run (by clicking OK) it searches for all of the included words and phrases and returns a report. 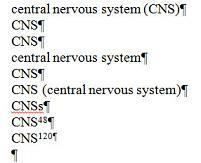 Note in the following example how it found only items that were added to the include list. Now you make your choices whether to replace one or more of the found items or to highlight one or more of the found items, just as before. 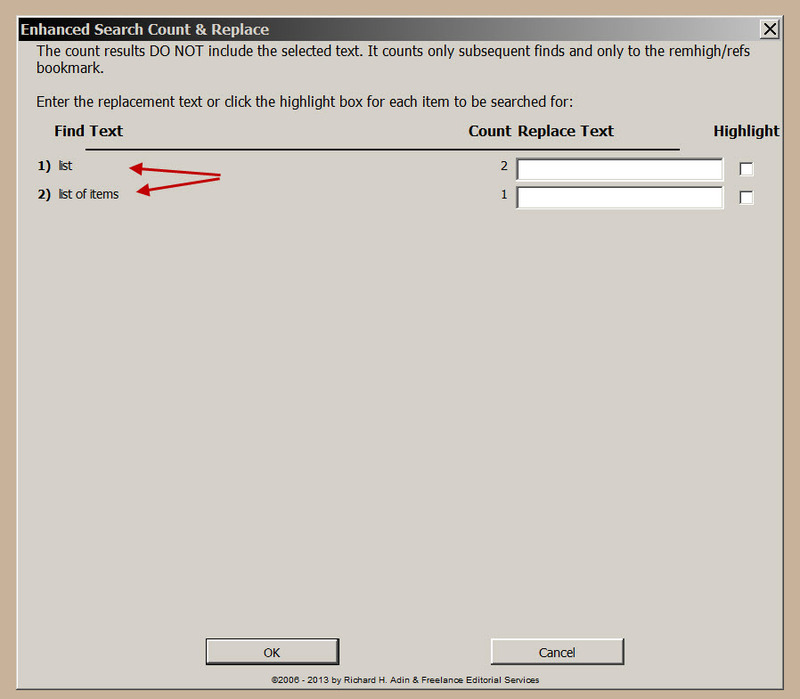 In version 4.1, the Enhanced Search, Count, and Replace (ESCR) macro replaces the original Search, Count, and Replace (SCR) macro. ESCR is significantly more powerful and accurate than the original SCR. IMPORTANT: The original SCR gave a count that included the selected item(s). ESCR does not include the selected search term(s). 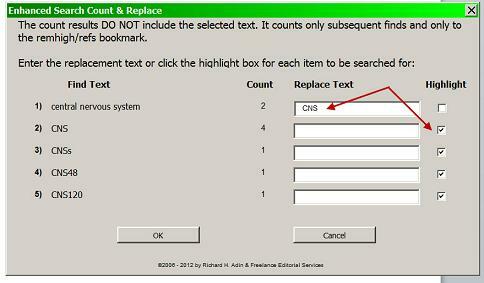 Consequently, ESCR will return a count of 0 if there are no subsequent instances of the selected search term(s); in contrast, the original SCR would return a count of 1. ESCR is counting only subsequent instances and only up to the remhigh or refs bookmark (whichever appears first), which designates where the text ends. In addition, the original SCR macro was limited as to what variations it would find. ESCR finds more variations so you get a more accurate count of occurrences. Consider a document composed of the terms shown in the image below. Note in image that the last two terms have reference callouts associated with them. The original SCR would not count those terms nor would it have counted entries like CNSs. 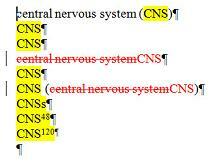 ESCR counts both variations, as shown in the image below. This image shows the screen that appears after selecting the first line as the search terms and the running of the ESCR macro. Note how the various instances of the text found are listed and counted. ESCR will show up to 9 variations. The results of the choices made (see above image) are shown in the following image. Changes are made with tracking automatically on.